WTN- Some plants that live in areas poor in nutrients or sunshine get energy in other ways. Carnivorous plants live, at least part of the time, off the nutrition they ingest from the insects they lure and devour. These carnivores are more specifically insectivores, and they often live in bogs and swamps. One of more than 600 known insectivorous plants, the Venus flytrap is common to swamps in north and South Carolina. The plant’s hinged leaves from traps that snap shut on insects alighting there. Trigger hairs on the inside of the leaves sense the presence of the insect. The insect must touch the hairs more than once for the trap to close- that way, the plants doesn’t react to a single touch, which might be from an inanimate object such as a windblown leaf. 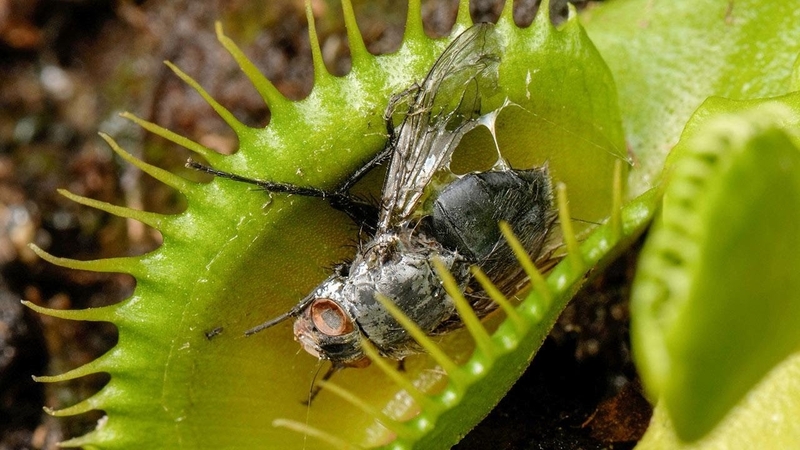 Once the flytrap has captured the prey, fluids inside the leaf dissolve the insect into nourishing liquid that the plant absorbs. It takes about ten days for the flytrap to reopen after a meal. Other insectivores include pitcher plants and sundews. The pitcher plant traps and drowns insects in a cuplike cavity of liquid and then dissolves them. The stalks of sundews are covered with super sticky, glistening drops of liquid that attract insects. The sticky surface traps the insect, and then the plant’s leaves bend around it to start the digestion process.